My only exposure to Judge Dredd is the 2012 movie starring Karl Urban and Olivia Thirlby, which I understand stays true to the comic while telling a pretty badass little crime story. I only watched it a week or so ago, so it seems appropriate that I finally got around to reading this collection of Dredd stories by Duane Swierczynski. Swierczynski quickly became one of my favorite authors after I tore through his excellent novel Fun and Games. I picked up this volume hoping for more of the same, although I haven’t read any of his other comic book writing. This volume collects several short stories, some of which tie together into a larger case and some of which are one-off side stories that break up the main plotline. The larger thread focuses on malfunctioning robots, but there is also a story about kidnappers threatening clones of famous people and a judge who has the mind of a killer living inside his head. The stories are generally short and to-the-point, but instead of making the book brisk and action-filled, it feels like Swierczynski is always rushing to the next plot point. The result just comes off as shallow and repetitive. Additionally, there isn’t much characterization to go around. It feels like this is probably appropriate for the universe – Dredd also didn’t have much in the way of characterization – but it doesn’t help that the dialogue is occasionally stilted or campy. Judge Anderson had more depth in the movie, but here she felt like nothing but a handy plot device. I was also regularly distracted by the use of made-up swear-words, which I’m sure fits with the series as a whole, but just felt silly here. 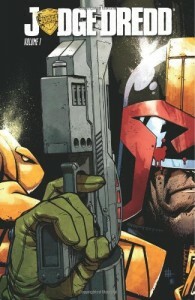 Ultimately, I felt like the episodic structure undermined this volume, and I would have preferred to see a longer, more developed storyline set in the Dredd universe. I might try to track down some of the older Dredd books for comparison’s sake, but I don’t think I’ll be reading any more of this series.